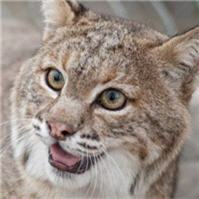 We received a phone call from a Garland resident that a bobcat had been running around in their back yard for a while. While the homeowner was at work her 14 year old son was able to capture Lydia and place her in a small dog crate. 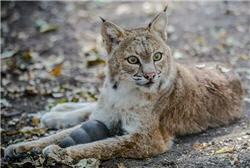 They asked if they could bring her to In-sync that evening, thinking that she was a wild bobcat, we were hoping that our vet could see her and she could eventually be returned to the wild. After the initial examination we noticed that all of Lydia’s canine teeth had been worn or ground down and she had obvious cataracts. After a series of x-rays we discovered that she had been shot in her left front leg. The bullet had gone in and chipped bone off of her elbow leaving her with excruciating pain. Blood tests revealed that Lydia was extremely anemic making surgery a bigger risk at that time. After 45 days we were able to complete the surgery and remove the bone chip from her leg. It has taken Lydia a very long time to be comfortable with people around her. 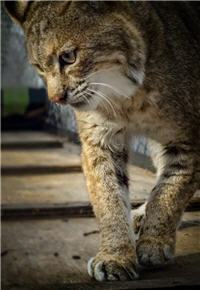 We are unsure if she was wild or had been someone’s pet. 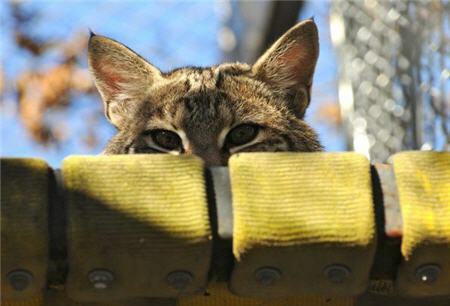 Because of her condition we know that Lydia will never be able to be released into the wild. Lydia still has not regained use of her leg since her surgery and she has experienced additional health problems such as vestibular disease affecting her equilibrium. 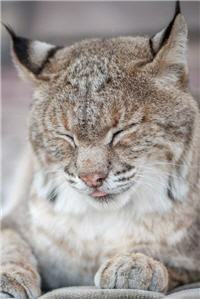 Lydia has made herself more comfortable in her surroundings and accepts her other bobcat friends. She also likes the human interaction love and attention she has so much deserved.